We are still receiving samples of winterburn on yew, arborvitae and other conifers. There is nothing to do once winterburn has occurred, we just have to wait and see how well the new growth covers up the dead needles. For more information of winterburn see the University of Minnesota Extension Yard & Garden News from March 28, 2014. I have noticed damage by fourlined plant bugs. 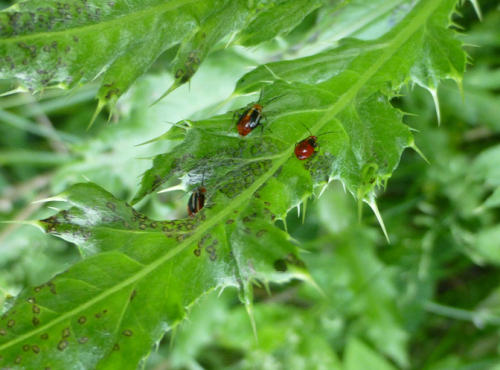 Their feeding leaves numerous small brown spots on foliage that look like a plant disease. It is often hard to find the culprits as they drop off the plant when approached. See the photo below. As hardwoods are more fully leafing out it is becoming clear which trees are in decline. Poor canopy and dead branches can indicate a tree is in decline. There are a variety of causes for decline. Please see our publication on tree decline or contact us to help you assess the health of your tree. Fourlined plant bug feeding injury consists of spots that resemble plant disease.